Photo by Scott Reagle Maple Grove’s Easton Tanner (73) rushes the quarterback to force an interception that was returned for a touchdown in the fourth quarter of Friday’s NYSPHSAA Class D state championship game. 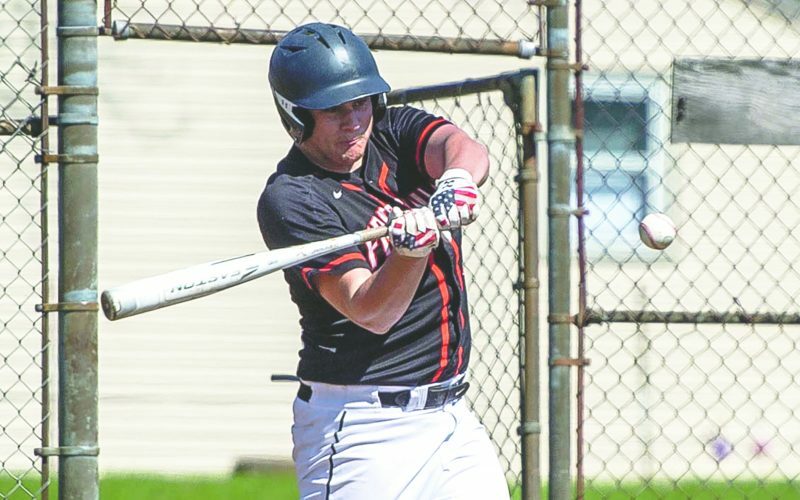 SYRACUSE — Facing a shift in momentum that threatened to block the road to a second straight New York State Public High School Athletic Association Class D championship Saturday afternoon at the Carrier Dome, Cambridge coach Doug Luke decided to play to his team’s strength and run the ball. The right side of Luke’s offensive line featuring Nathan Genevick, Max Hoffer and Brenden Holcomb was more than happy to pave the way. 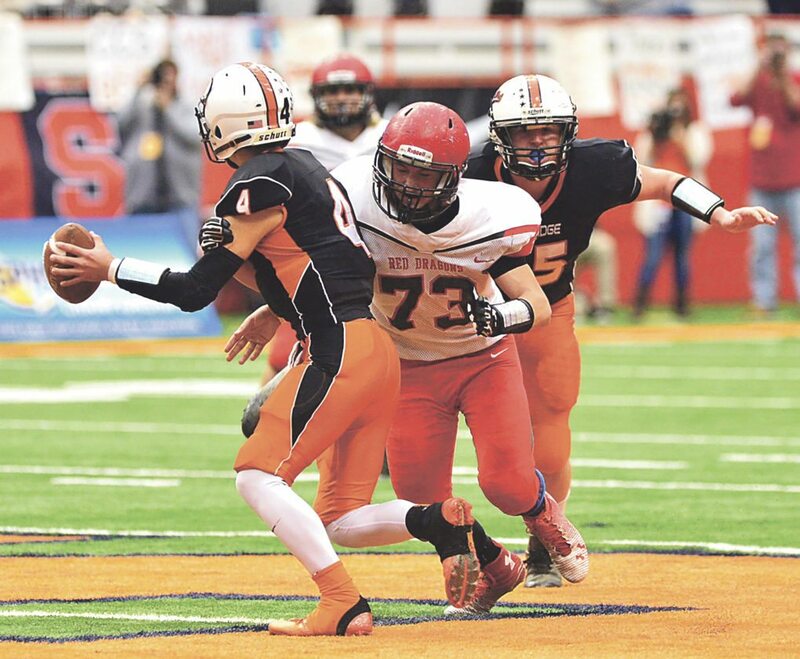 Colton Dean capped a 14-play, 68-yard drive with a 9-yard touchdown run midway through the fourth quarter as the Section II champions crushed Maple Grove’s dreams in the state final for a second straight year with a 26-14 victory on Ernie Davis Legends Field. The game-sealing drive, during which Cambridge ran the ball exclusively, capped a dominating performance by the Indians that saw them outgain the Red Dragons, 460-248, and yet the Section VI champions needed just one more stop late to put themselves in position for the victory. With Cambridge leading 19-7 early in the fourth quarter, quarterback Zack Rowland dropped back to pass on a second-and-11 from the 41-yard line. Maple Grove senior Carter Russo was able to pressure Rowland, grabbing him by his jersey as he unleashed an ill-advised pass into the middle of the Red Dragons defense. Junior Easton Tanner was in the right place at the right time, intercepting the throw and running 55 yards for a touchdown that made it 19-14 after Zach Fischer’s PAT. Undeterred, the Indians took over at their own 32-yard line with 10:02 remaining and proceeded to put the game away. Tommy English had six carries for 37 yards, Tyler Linendoll had two carries for 6 yards, Jonas Butz had a carry for 2 yards and Colton Dean had five carries for 23 yards – the final run giving Cambridge a two-score lead it would not relinquish. The Indians wasted no time jumping on top early as Rowland connected with Holcomb for a 65-yard touchdown pass and catch on the second offensive play of the game and Helen Mooney added the PAT for a 7-0 lead just 51 seconds into the game. Maple Grove answered right back with an impressive 13-play, 80-yard drive that culminated with a 5-yard Tanner-to-Fischer touchdown connection on fourth down. Fischer’s PAT made it 7-7 and it was game on. Two possessions later, Cambridge took back the lead with a 10-play, 93-yard drive that took just two minutes and 39 seconds off the clock. The Indians picked up double-digit yardage on five plays during the drive, which was capped by Dean’s 1-yard touchdown run to make it 13-7 with 9:10 remaining. The Red Dragons picked up just one first down over the next two possessions, giving Cambridge the ball back with 2:25 left in the half. Working with a short field, the Indians added on, going 38 yards in three plays, highlighted by a 27-yard run from Butz before Linendoll scored from 6 yards out for a 19-7 lead. Maple Grove got as close as the 12-yard line early in the third quarter, but Max Hoffer sacked Tanner on fourth-and-5 giving the ball back to the Indians. Cambridge’s defense limited a powerful Red Dragons’ rushing attack all day long, holding Nick Fabrizio, Nash Nelson and company to just 155 yards on 40 carries. 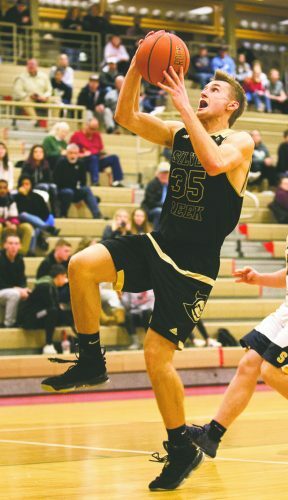 Maple Grove will have work to do as it looks for a third straight appearance in the state final next season, losing nine players to graduation this coming summer.